I can’t decide if I would be hurriedly walking in the other direction or on the floor laughing. 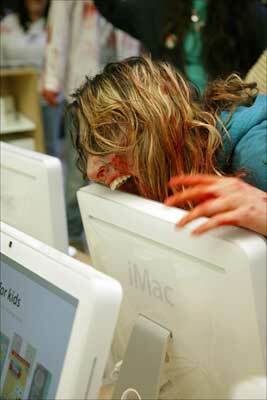 Apparently the Mac-hungry zombies were part of a larger effort to invade San Francisco’s Union Square. Gee…nothing like this ever happens in Boston. Maybe it’s too cold? Or maybe it’s because the city of Boston would consider it a terrorist attack, shut down the city for a half day, then charge the organizers with a crime and fine them a couple million dollars to cover the expense of shutting down the city. If Boston mistakes Lite-Brites for bombs, I can’t imagine what would happen if they saw zombies walking down the street. No offense meant, I’m just saying.